David R. Cheriton School of Computer Science professor Raouf Boutaba, former PhD student Qi Zhang, and former post-doctoral fellow Mohamed Faten Zhani were awarded Best Paper at the IEEE/IFIP International Conference on Network and Service Management in Rio de Janeiro, Brazil last week. David R. Cheriton School of Computer Science professor Reid Holmes and PhD candidate Laura Inozemtseva have won an Association for Computing Machinery Distinguished Paper Award for their paper Are Mutants a Valid Substitute for Real Faults in Software Testing? at the 22nd ACM SIGSOFT International Symposium on Foundations of Software Engineering. The Waterloo Black team finished 1st at the East Central North America Association for Computing Machinery Regional Programming Contest in Windsor, Ontario this past weekend. The Waterloo Red and Gold teams, which comprised of only first and second year students, placed impressively 7th and 8th place respectively. 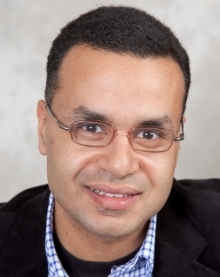 Ihab Ilyas, a professor with the David R. Cheriton School of Computer Science has been named an Association for Computing Machinery (ACM) Distinguished Scientist. Mobile-payment company Square is holding a code camp at its newly opened downtown Kitchener office this Wednesday evening for 40 young women studying computer science at the David R. Cheriton School of Computer Science. This is the only code camp that Square is running for computer science students in Canada. During the camp, students will learn about developing their technical brand online by working on open source software with Square engineers.